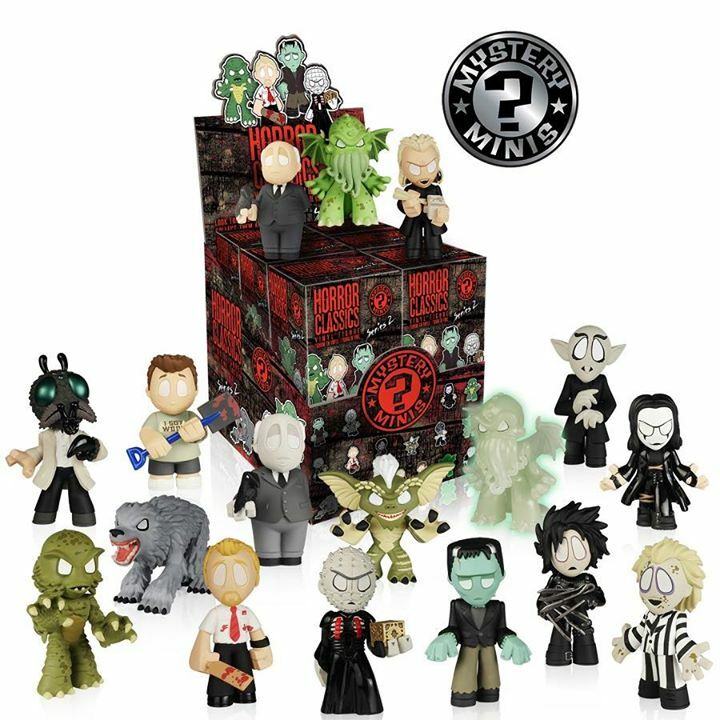 Idle Hands: Funko Horror Classics Mystery Minis Series 2! Now here's a series I can't say no to. Oh, How I tried. I managed to run from the first wave and only got some random pieces in trades just because they were deals I couldn't pass up, but now, with additions like Lost Boys, American Werewolf in London, Universal Monsters and HITCHCOCK HIMSELF.....who could resist? Funko is evil, evil, evil. Just take my money now. Funko's second series of Horror Classics Mystery Minis includes Cthulhu (with a Glow in the Dark variant), Shaun and Ed from Shaun of the Dead, David from Lost Boys, Frankenstein's Monster and The Creature from the Black Lagoon from Universal Monsters, Beetlejuice, The Crow, Edward Scissorhands, Nosferatu, Pinhead from Hellraiser, Stripe Gremlin, Hitchcock (with a Black and White variant), The Wolf from American Werewolf in London and The Fly!! For the noobs, know that these suckers are blind boxed, so you've got to work at getting the ones you want and risk doubles. Hit up Facebook boards for reputable folks to trade with! We expect Funko's Horror Classics Series 2 Mystery Minis in stores very soon. I love the look of these but I hate the blind boxed mixed with chase variant aspect to the standard mystery minis. I loved how Funko released the Garbage Pail Kids line: Each figure was packed evenly at one per case. That way if you wanted the entire set you could just buy one case. Any idea how these are packed?